Nothing like popsicles on a warm day for a refreshing treat. And this superfood recipe is more than just a refreshing treat — it's good for you too! These low-carb, healthy popsicles are loaded with antioxidants from multiple organic superfoods. And when he found out that there would be berries in them, he was even more excited. 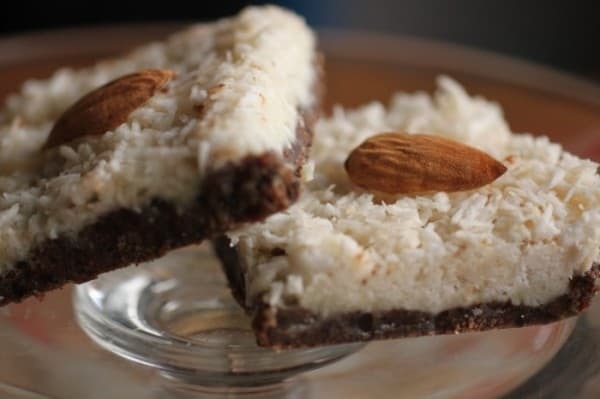 I got this superfood recipe from a friend of mine awhile ago, and we just LOVE it! Actually, we haven't made popsicles in a long time. Not sure why, but we haven't. So we were so excited to do it again and to find a recipe that is fun, delicious, and even beautiful! Superfoods are kind of a word that's thrown around today a lot, but basically they are foods that are powerhouses of nutrition. 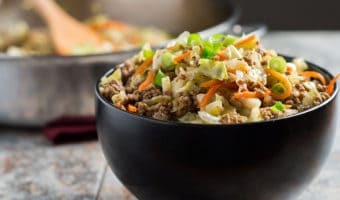 If you've been around my blog for awhile, you know that I used to eat the Standard American Diet (SAD), but had to move to lower carb foods due to candida. 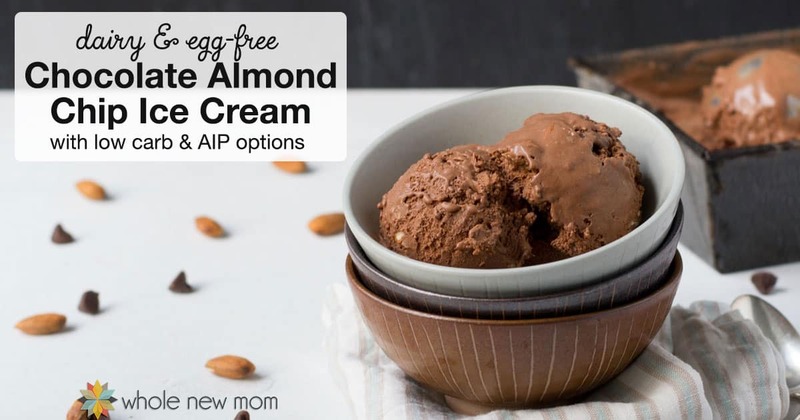 We also are pretty much dairy free around here due to my oldest's life threatening allergy to dairy (amongst other things). But more than just trying to avoid things like sugar, loads of carbs (especially refined carbs), and the things my son is allergic to, we have really been making an effort to put more healthful foods into our diet to improve our health. The main things we have been trying to increase in our diets are vegetables and fruits, particularly low-carb fruits like berries, and superfoods that pack an extra punch of nutrition. So I've been looking for new ways to get more produce into our diets without adding too many carbs. I've tried various green drinks and have found them to be a great help. You can easily put the powders in smoothies or add them to recipes, but this idea of making popsicles out of them was just too fun. For this superfood recipe, you can of course use whatever fruit powder(s) you like, either using a pre-made blend or blending up your own to taste. I like to blend up fruit powders in water with a little stevia extract powder as an afternoon pick me up drink, but this healthy popsicle recipe is our favorite use thus far. You can either buy a blend of berries or you can make your own. If you want to make this recipe by making your own Fruit Blend, here are some products to get you going. Yes, the powder ingredients for these Superfood Berry Popsicles are not cheap. But they are superfoods. And you only use 2 Tbsp for the whole recipe, so a little goes a long way. You can save some money by DIYing a blend to your liking or using more of the less expensive fruits. Just be careful what you purchase and read the reviews first. Many of the powders become rock solid quickly after purchase so that's something to watch out for. The recipe calls for 2 Tbsp of a Berry Powder so the following suggested ingredients will go a long way. You can either DIY your own blend or use a premade powder. Blend all of the ingredients together in whatever proportion you would like and use in the recipe. Blackcurrant Powder – high in anthocyanins. Supports good circulation and skin radiance. Goji Berry Powder – often called the “elixir of youth.” It's stickiness shows that it has polysaccharides in it and helps moisturize skin from the inside out. 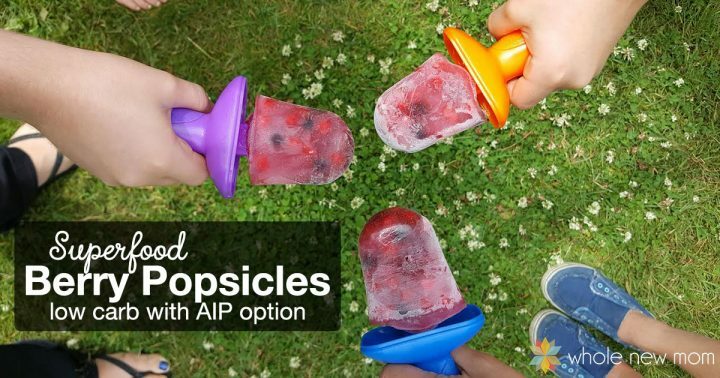 These popsicles are great since they are obviously loaded with nutrition are low carb, no sugar-added, and even adaptable for the AIP diet (Autoimmune Protocol or Autoimmune Paleo). – This organic superfruit blend. I love the taste of this, but it does clump up easily. You can see in the reviews that it's happened to many people (and it happened to me). I do love this company, however. – Try BioFruit from Purium. 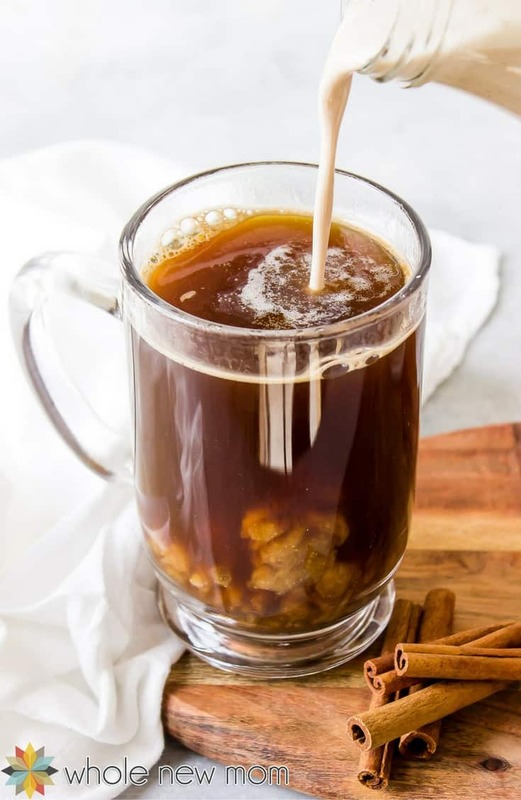 It's somewhat pricier, but you can get the greater of $50 or 25% off your first order of $75 or more using code wholenewmom and this product tastes amazing. Plus you get 15 – 25% off your future orders. I love this blend. Since you don't use much powder for these popsicles, either of these blends are a great value for this purpose. These Popsicle Molds will give you popsicles very similar to the ones in the image. But you could use any shape or variety you like. 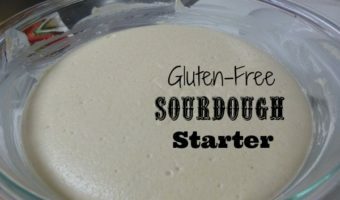 For the AIP option for this recipe use another fruit powder because the powder that I used contains some non AIP foods. I couldn't find a powdered superfood powder blend that was certified organic anywhere else, but you could make up your own using individual fruit powders that work for you. I typically don't give any kind of nutrition counts, but from my quick calculations, if you make small popsicles (like the 1/2 cup push up pops that we used) they have about 5 grams of carbs from the berries (we used blueberries) and 1.3 grams from the berry powder. So a total of 6.3 grams of carbs per popsicle. We used 2 scoops (1/16 tsp) of stevia. See How to Use Stevia. Omit for most AIP diets or use honey or maple syrup. 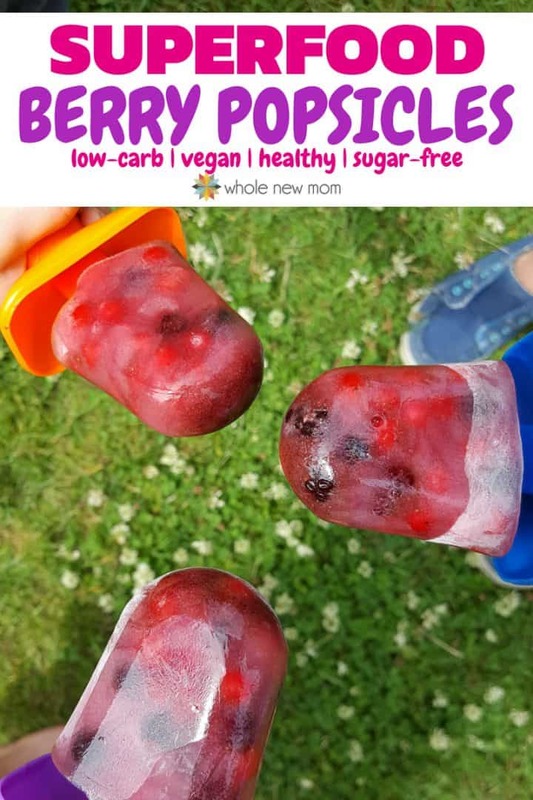 These Superfood Berry Popsicles are Low-Carb Popsicles made with Superfoods and are loaded with antioxidants for amazing health benefits. Blend the Berry Powder with 2 cups of water. Add the juice of ½ of a lemon (1 Tbsp of lemon juice) to the blended mixture. Stir well. 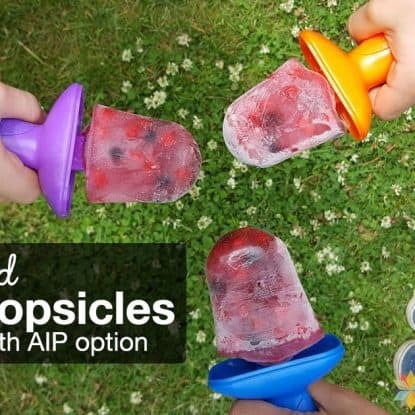 Fill the popsicle molds half way with berries. Pour the Berry Complex Mixture over the berries to fill. Freeze 'til solid. About 5 hours for large popsicles. These healthy popsicles are so good – my youngest would eat all of them if I let him — but alas, he has to share :). I hope you enjoy them too. It feels great knowing that I got some fabulous nutrition into him and not junky sugar-laden stuff. What is your favorite frozen treat? I enjoy reading your posts; I always learn something else to do to be more healthy.